The San Bernadino Sheriffs office today denied they intentionally burned down the cabin where Christopher Dorner died. 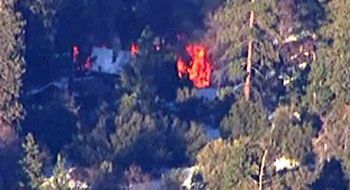 "We did not intentionally burn down that cabin to get Mr. Dorner out," Sheriff John McMahon said at an afternoon news conference. He said deputies initially fired conventional "cold" tear gas into the cabin in Seven Oaks, near Big Bear Lake, then switched to "pyrotechnic-type" rounds" known as "burners." Update 8:30 pm MT: Manhunt over. A charred body has been removed from the cabin. It is believed to be Dorner. See my update below at 5:17 pm -- the shot referred to on the police scanner was Dormer killing himself. Update 6:20 pm MT: Reports SWAT team is moving out. No definitive word on whether he is in the cabin, dead or alive. Time for State of the Union. Update 6:00 pm MT: Great thread of scanner communications. The cabin has collapsed. Reports are that Dorner is not inside. There is no confirmation he has been killed.